I had a bunch of leftover half square triangle blocks from the Radiate and Ripple quilt and wracked my brain to figure out a way to use them up. In the end I settled for pairing up the blocks to make the traditional flying geese block, but the end result was "blah" to me. 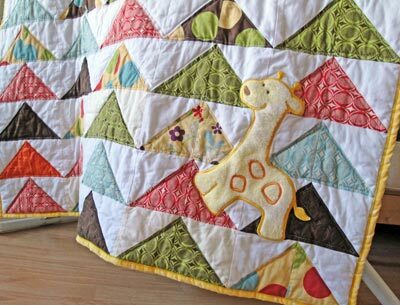 Imagine the quilt without the giraffe. A tad dull, right? So I draped the top onto my ironing table, stared at it, and waited for inspiration to strike. At some point I remembered that a bunch of pre-made animal applique shapes were taking up space in one of my boxes of stuff. 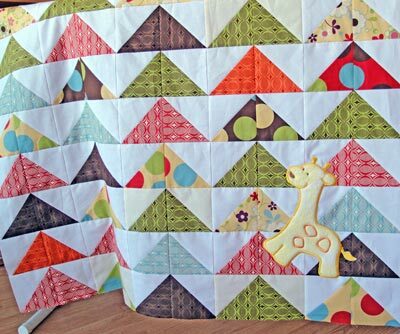 The giraffe makes the quilt sing, I think. The finished quilt is 36" x 40" and the batting is a higher loft polyester than the normal thin cotton batting I use, but the end result is comfortably poofy and snuggly quilt. I like it. To me, the colors and giraffe remind me of an idyllic day at the zoo.